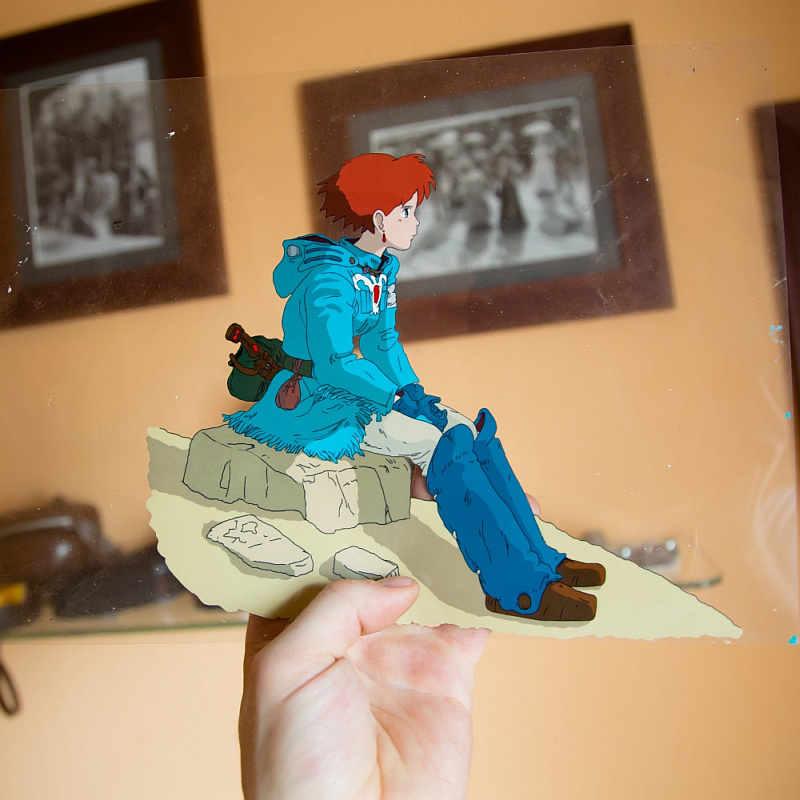 Cels, short for Celluloid, are in animation used foils. Lines are print or drawn on those anf afterwards colorized by using acrylic color where as they result in motives fully opaque. For complex scenes, multiple foils will be stacked together or get replaced after each frame by a new one. 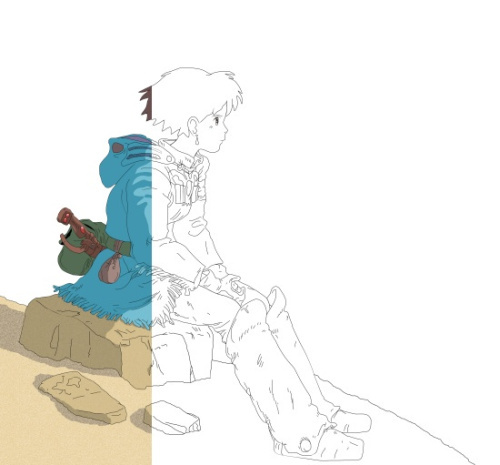 Nausicaä of the Valley of the Wind is a japanese manga and anime drawn by Hayao Miyazaki, released in 1984. 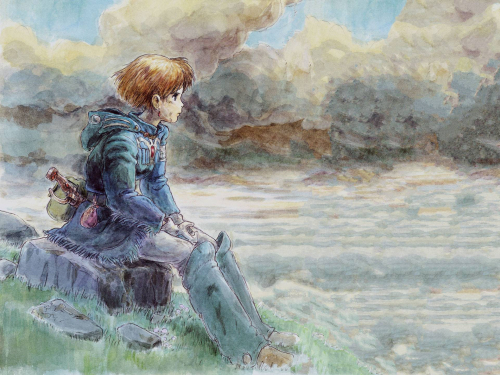 Nausicaä is a princess living in a toxic world that is at war. While the nations fight each other, she’s taking more consideration to the toxic jungle that is swamping futher to the last habitable zones. She realizes that she has a gift to understand the insects giving her empathy towards them but living in those worlds puts her inbetween the insects and the humans soon enough. I’ve taken this drawing out of Hayao Miyazakis manga, where she’s sitting on a hill and probably watching the “Sea of Decay”. 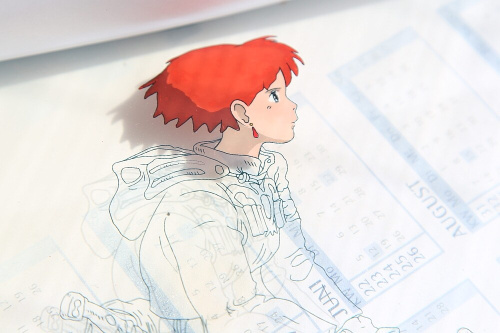 I like the motive so much that I’ve decided to redraw it and adapt the anime look to it – on cel. Well now I have to confess, that to this time I had no idea about how cels work. I have created the new motive entirely new on the computer just to get an idea about the final one. In the End I have split everything in layers such as the contours, colors and background. The color setting is adapted from the anime movie and the surroundings are set to the desert like ambience of the movie. The contours were mirrored print onto foil. Usually the professionals would use the Xerox print technology but since I can’t get my hands on those, a normal laser printer will have to do the job. Mirroring is very important. As I will colorize with acrylic color, I might cover some printed lines but that doesn’t matter. Once it is finished, you will see the foil’s back side and therefore the correct motive again. After some time, the foil finally took shape and especially when I started with the sand colors, I knew that I almost made it. I always have tried to mix the colors with ther base colors like cinnabar, ultramarine, yellow, black and white. But on cobalt turquoise I really failed and had to use this as an additional color slightly modified. The result is stunning for a first attempt. The colors are truly opaque and strong. In the end I have cleaned the foil and framed it.